(Phys.org) -- Researchers and laymen alike know that some non-Newtonian fluids tend to harden quickly upon impact. Quicksand is a good example. If a person walks quickly, they wont sink. But why this happens has been somewhat of a mystery, though many in the science community have suspected it had something to do with energy being transferred to the walls of the container. New research finds thats not the case at all. Instead, after extensive testing and experimentation Scott Waitukaitis and Heinrich Jaeger of the University of Chicago have found, as they describe in their paper published in the journal Nature, that its because the particles suspended in the liquid temporarily mash together, creating a near solid. Non-Newtonian liquids are those that dont behave as Isaac Newton originally theorized, e.g. 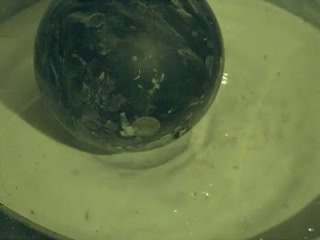 quicksand, ketchup, custard, blood, or in the case of the material studied by the research team, a water and cornstarch solution called oobleck. To find out what goes on with oobleck when impacted from above, Waitukaitis set up several different sized tanks of the goo and filmed what happens when a flat bottomed rod strikes its surface from above at varying speeds. He also pointed an x-ray gun at the mix to see what happens underneath the surface and used a laser pointed across the surface to measure how its surface changed when impacted along with a force sensor on the bottom of the tank directly beneath the impact zone. In studying the results, the two found that the size of the tank didnt matter as the oobleck hardened the same amount regardless. Thus, theories about energy absorption by the walls accounting for the unusual liquid properties are wrong. Instead they found that the tiny particles that are normally suspended in the liquid are suddenly jammed together when impacted from above, creating a cone like shape inside the liquid that is dense enough to be described as a temporary solid; as it just as quickly dissolves back to its original state. The authors describe the action as akin to snow that is suddenly pushed into a denser state by a plow. 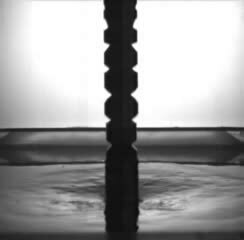 The study does answer the major question of why a non-Newtonian liquid hardens, but still a mystery is what happens with the suspended particles when in their hardened state. Do they touch each other or just come close and why do they move apart again after the initial impact? Also, are there differences in hardening as particles get smaller and smaller? Future researchers will no doubt be looking into answering such questions as non-Newtonian liquids might become more useful if their properties become better understood. They might serve as a lighter material in bullet-proof vests for example, or provide a better cushion for people involved in a car crash. Fascinating - a kind of spontaneous phase change, almost..? The article makes an analogy to snow being compacted by a plow, however another, perhaps closer analogy might be how ice is instantaneously compacted to water and back again as a skater passes over it...? ..theories about energy absorption by the walls accounting for the unusual liquid properties are wrong.. I doubt, someone could consider such theories seriously, because the dilatant behavior works even for materials without any walls, which is tested for body armor applications. I'm surprised this phenomenon hasn't been thoroughly studied already long time ago. A Nature article from starch-water suspension in 2012... Wooah! I think that not only fluids do have this hardening reaction at impact. Any elastic material gets hardened at impact due to instant compression as the result of the deformation of the contact surface. Fluids, naturally penetrable at slow speed, just make it more obvious. For example, a bullet impact in a soft brick wall. The first layers of the brick get hardened enough to deform the solid metal bullet before a hole gets created. High speed impacts imply great inertial acceleration for those tiny components to get instant compression and higher material density. People often behave like the particle systems, when they get stuck against new ideas because of their mutual social interactions. After the previous post, I just remember that we experience the compacting of fluid each time we swim. Without the hardening of water under our strokes, we are then unable to move forward. Olympic swimmers make speedy and powerful strokes to get "hardened water" to go faster.